Slot 2 had 3 questions from Data Interpretation (all Table based), while rest all the questions were from Quantitative Aptitude. Questions in slot 2 were on the similar track of slot 1 with 6 questions from Ratio and its application. These questions varied from Ratio, Alligation, and Mixture, Time speed distance (Average speed and Boats & stream), Work rate time (1 easy, 1 moderate). There were 2 questions from Mensuration and 1 questions from Geometry. Percentage and its application had a share of 7 questions: Percentage 3 questions while Profit & loss and Simple Interest & Compound Interest had a share of 2 questions each. Surds and Indices showed its presence with 3 questions while Probability and Number system with 1 question each. And to our surprise, one question was from symbols representing arithmetic operations. There was no presence of Permutation and Combination, Trigonometry, Logarithm, Inequality, Function and Data Sufficiency. Overall, the questions from this section were easy to moderate. A candidate who attempted around 21-23 questions in this section with a suggested time of 45 – 50 minutes can expect a good score. The questions in this section varied from 15 questions on Arrangements and Puzzles to 1-2 questions each from Syllogisms, Coins, Direction, Number Puzzle, and Relation. 2-3 questions from Puzzles and Arrangements were time-consuming and one question each from Truth and Lie concept and Coins were bit tricky. While questions from rest of the topics were not time-consuming and were of easy to moderate difficulty level. The overall difficulty of this section was moderate to difficult and the most time-consuming. With Approximately 16-18 questions easy to solve, an attempt count of 20-21 can be termed good with a suggested time of 60 minutes. The section tested reading skills of the aspirants with 4 RCs, out of which one had 6 Questions and the other three had 3 questions each. The topics covered were: Niti Aayog, Sports, Smoke Detectors, and Chechen – Russian Conflict. 10-11 of these 15 questions were easy to solve. These were direct questions where locating key-words would determine the answers. Around 2-3 inference based questions, which were moderate in difficulty. The Verbal Ability comprised of 1 FIJ, 1 idiom & phrase, 1 Synonym (Sentence –based), 2 Antonym, 1 Analogy, 2 Word Usages, 1 Para jumble, and 1 grammar statement. Surprisingly, there was no presence of Critical Reasoning, Strengthen/Weaken Argument, Statement-Assumption, and Statement Conclusion. In comparison to the RC questions, the verbal ability part was relatively moderate to attempt. Overall, the questions from this section were easy to moderate. With Reading Comprehension a little less time consuming as compared to the past trend, an attempt of 20-22 can be termed good with a suggested time of 50 minutes. This section had questions ranging from Government Schemes, Indian Constitution, Laws and Rights to Science and Technology, History, Art. Each of them had a presence of at least two questions. Overall, 11-13 attempts can be termed good in a suggested time of 10 minutes. 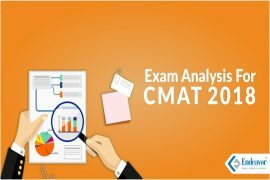 An overall score in the range of 255 to 260 can be called equivalent to 98 percentile and a score in the range of 220-230 can be called equivalent to 94 percentile for afternoon slot of CMAT 2018. Test Inquiry from Digicorp. So please ignore it.